Castle Taj seems like a truly authentic Indian restaurant. It almost feels as though you’re walking into an Indian family home and they have graciously agreed to cook for you. The first thing you’ll notice is the incense burning, then the unmistakable smell of alluring curry in the air. A small slice of India in the middle of Castle Hill. The employees are incredibly polite and the décor, including the Indian pop music on the screen and coming out of the speakers, really adds to the exotic eastern experience. The strange thing is that Castle Taj is rarely busy. This could be because many people choose takeaway instead of sitting down and having a meal. 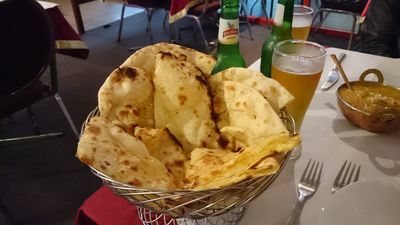 There is nothing wrong with their takeaway, in fact it’s some of the best Indian takeaway around, but people miss something special by not dining in. 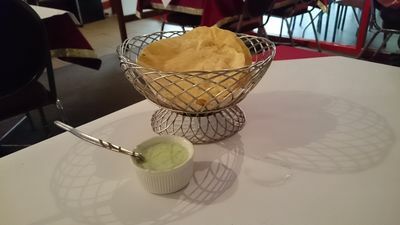 After being seated, patrons will quickly be presented with complementary papadums and cucumber yoghurt. Papadums are not filling, and good ones like these provide a nice salty treat to whet your appetite. The cucumber yoghurt is also a nice touch. Gotta love a little garnish. 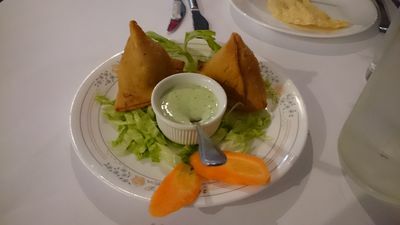 As an entrée, any samosa will do. On the specials they had the kheema (qeema) samosa ($7.90) - a mild lamb samosa, cooked excellently. The mince was delicate and carried a salivating balance of flavour. The crust, hinted with a bit of lemon, was hard and thick enough to hold its integrity, but was still crumbly and soft enough to eat easily. It’s like eating a savoury dessert for an entrée. Chicken tikka masala - don't worry about that red sauce and the white table, it's a disposable table cloth. 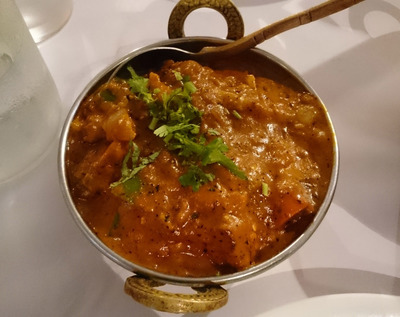 A western favourite, the chicken tikka masala ($17.90) does not disappoint. The sauce is thicker than the usual food court masala and is sweet with crisp capsicum and onion. The chicken is tender meat, well proportioned and without any sinew. If you haven't had fish curry, you need to put that on your list. While chicken and lamb are always safe bets, don’t be afraid to try fish. The Goan fish curry ($16.90) is delectable. The fish is fall-apart-tender and carries a luscious flavour into your mouth. 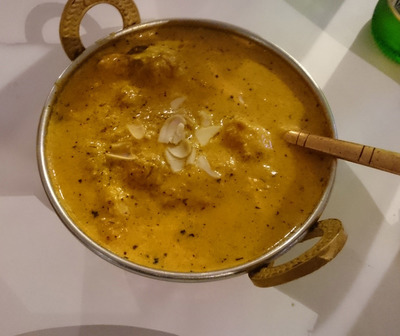 The sauce has a creamy texture, rich with saffron, pepper and orange, and of course, curry. Looks can be deceiving. Don't let its size fool you - it's more than you might think. 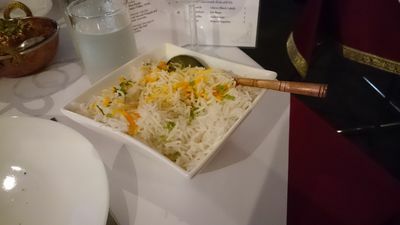 These two dishes, with a large side of rice ($4), and as is highly recommended, a basket of naan bread - garlic, plain and cheese ($9.90) - will easily feed two people, especially with an entrée to boot. Having trouble deciding what kind of naan to order? Just get all of them! Castle Taj is a little pricier than other places, and the phrase ‘you get what you pay for’ immediately comes to mind. 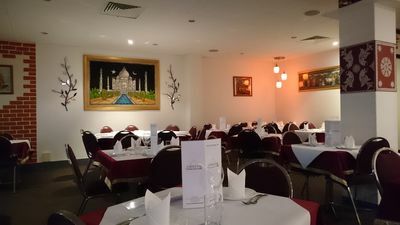 Castle Taj offers up some of the best Indian food in Sydney. In fact, for a place that does takeaway, it offers some of the best food, full-stop. Food court versions don’t even compare. Even Castle Taj’s rice has an amazing amount of effort put into it. When has plain rice ever been so colourful? Do not let the size of the dishes fool you. 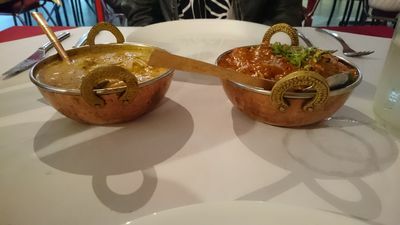 They might look small at first, but they are a challenge to finish, and that won’t be for lack of effort, as you mop up every drop of sauce on the plate with the last piece of naan and lean back in the chair with a satisfied smile. Cost: Entrées from $5.90 - $17.90. Mains from $11.90 - $19.90. Dinner: Open every night from 5pm till late.